When someone first arrives at your business or facility, one of the first things they see is the parking lot. First impressions matter a lot, especially in business. 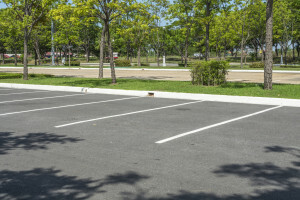 When someone pulls into you parking lot, they immediately, if not subconsciously, begin assessing the functionality and aesthetic appeal of your business, beginning with your parking lot. Why Should You Go Through the Trouble? Beautifying your parking lot seems like a bit of overkill, right? This could not be farther from the truth. Psychologists believe that the vast majority of communication is non-verbal. For instance, in an interview, how you dress, your handshake, your eye-contact, the tone of your voice, your posture, your smile, etc., will contribute more to the first impression of the interviewer than the actual first words you speak. The same is true when running a business. The second someone comes to your business, you should be building their trust and respect. A functional, aesthetically pleasing parking lot probably won’t close a deal, but it might get you off on the right foot. The first step is to make sure that your parking lot is clearly marked. Parking spaces, lanes, no-parking zones, etc., should all be painted often enough to remain clear and bright. Not only does this increase safety, it increases the ease of use for your parking lot. In turn this creates a more worry-free experience for your customer or client. In addition, a parking lot with faded lines, cracks, potholes or worse, weeds, gives an impression of neglect and carelessness. Those are not traits people are attracted too. Now on to the fun part of parking lot landscaping: the greenery. Greenery brings beauty and a refreshing shade to parking lots. It also helps to reduce wind and wind driven rain to a small degree. In addition, shrubs, vines, or small trees can help meet city ordinances which require some sort of wall or fences. An attractive barrier will focus attention on entrances or where you want people to look. A bed of flowers, ground cover, or shrubs can fill an otherwise unusable space in a lot. It can also help allow for snow removal, and add to visual variety. Of all types of greenery, trees are the most essential. They help guide traffic, provide shade, and frame views. Trees require less maintenance than shrubs and are not as likely to collect trash. If they are needed or the room can be spared, plant them. They are a great investment for the long term, as they increase property value. Even trees which grow accidentally around the edges of the lot can be encouraged as they help screen from neighboring buildings and roads. At Greener Horizon in Middleboro MA, we understand the importance of designing your office and parking lot landscape to facilitate business. If you need help deciding what to do regarding your lawn, parking lot, or any other landscaping services, be sure to contact our expert team. We will walk you through the process, answer any other landscaping questions you may have, and schedule a complementary consultation.